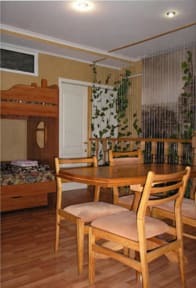 'Pletnevsky' Hostelis located in a XIX century building in the center of Kharkov. It is a historic area of the city where the various architecture styles and times are melted. Wide avenues and narrow streets, animated squares and quiet parks, old Russian negotiant houses and the buildings of early Soviet period create a unique atmosphere of a monumental megalopolis and cosy townlet at the same time. 3 underground stations ('Maydan Konstitutsії', 'Istorichesky muzei', and 'Prospekt Gagarina') are located 8-10 minutes of walk from the hostel. The rooms have been just renewed. At your disposal are kitchen (having gas stove and fridge), two WC and two shower. 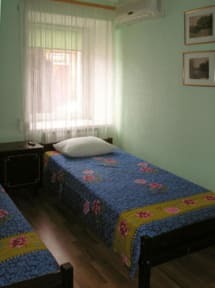 Our friendly staff members are available 24 hours a day to serve your needs and we feel right at home suggesting activities to make the most of your time in Kharkov, or helping you plan your outward trip when you leave. The city guide and map are offered for free to each of our guests. Check-out/check-in at 11 a.m. But no problem, if you need to check in/check out earlier or later. We will meet you at any time. We offer a luggage-storrage for free.